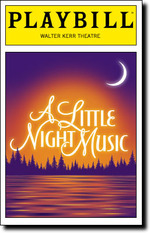 A musical about an aging actress, her love interests, and a number of romantic sub-plots. Between Broadway and 8th Ave.
A good, but not great show. (I went to see Angela Lansbery). Nicely done, but set is simple, music is just OK (only memorable song is Send in the Clowns. Just can't see that Catherine Zeta-Jones is the best actress in a Broadway show. ?? ?